Monetarism emerged in the 1960's under the leadership of Milton Friedman, who received the Nobel Prize in 1976. Friedman taught at the University of Chicago during this period, developing monetarism as a branch of Frank Knights' famous "Chicago School" of economics. 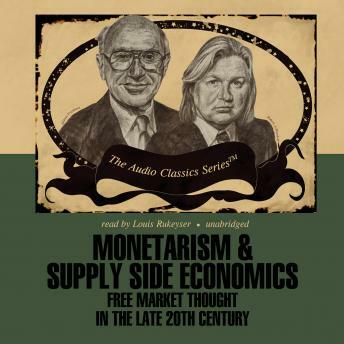 Monetarists emphasize the role of money and the government's monetary policy in economic affairs; they vigorously defend the free market in their work. Supply side economics, another modern branch of free market economics, emphasizes the harmful role of impediments to production (such as taxes). Robert A. Mundell is often considered the father of this modern school of economic thought. He explained his basis of supply-side thinking between 1962 and 1971 and influenced another, now famous economist -- Arthur Laffer (one of his former students). This school of thought advocates government policies that would stimulate increased overall economic production, rather than to redistribute existing production. Supply-side economists emphasize the role of property rights and of sound currencies in encouraging the growth of production and an improved standard of living.